The USSR definitely could be proud of its animated films with dozens of characters and plots depicted in unique cartooning styles. And it’s not just light children's stuff – when it comes to psychedelic, mind-blowing cartoons that leave you goggling at the screen, the USSR had a lot to offer. Here are four almost insane but at the same time wonderful pieces of art born in the late Soviet Union. Don’t forget to turn the English subtitles on! This clay-animated cartoon is kind of a classic for winter holidays but a very unusual one. It is surreal from the very first moments: for few minutes a narrator, who actually is one of the two main heroes, is trying to decide on which story to tell, changing subjects with the speed of a bullet. Finally, he focuses on a story of a funny man (greedy, not so clever but somehow charming) who goes to the forest to get a pine tree for the holidays. Otherwise, his strict wife won’t let him go back home. Typical Russian story, you know. You’d better see the rest with your own eyes. Let’s just say that the man will become king, transform into a human TV, catch a magic pike – and all this while constantly arguing with the narrator. 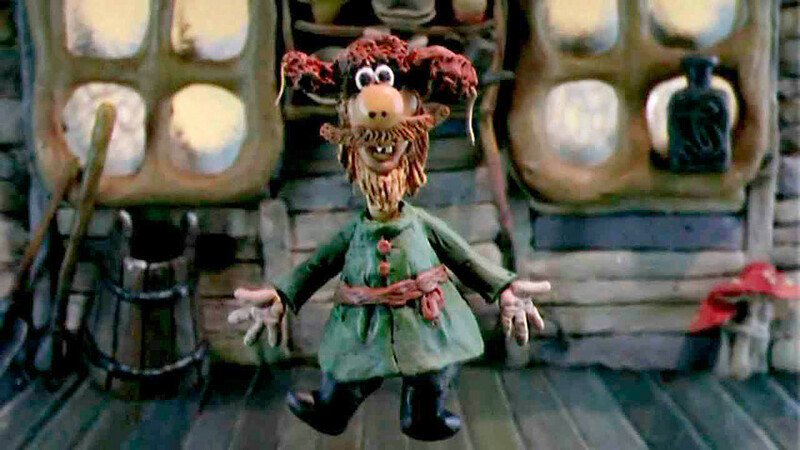 His lispingly pronounced phrases such as “Malovato budet!” (“Not enough!”) became an inseparable part of Russian folklore and the absurd humor of the cartoon is just iconic. Nevertheless, it leaves the viewer with a touch of wintertime melancholy, light and philosophical. Armenfilm, a local studio situated in Yerevan (now the capital of Armenia) bestowed many insane-looking cartoons on the Soviet film industry, with Armenian artists depicting bizarre worlds and non-existent creatures. And Wow, a Talking Fish is 100% proof of this. Just imagine – a poor old man catches a talking fish, then lets him go (a classic plot) but then out of nowhere the weirdest creature appears, restlessly changing its shape that calls itself “E-ekh!” The creature has no connection to the fish whatsoever and seduces the old man with a magic gift… but then it turns out that everything has its price. The cartoon, based on Armenian national legends, is short and enjoyable to see. However, it contains a scene where the heroes talk so fast that perhaps it’s better to watch it in slow motion. Even if you’re Russian, it’s still quite hard. One might wonder – how much absurdity can be placed into a four-minute cartoon where there are only three heroes? Well, judging by Wings, Legs and Tails the answer is “a lot.” Not so surprising if you know that the three heroes are a lizard, an ostrich and a vulture (all very bad-looking), lost in the middle of nowhere in some desert. Basically, the only thing the animals do in the cartoon is to argue about which body parts are more important. And boy, do they compete in a very strange way. This cartoon was also directed Alexander Tatarsky who made Under Yesteryear’s Snowfall and though the two pieces of art are quite different, something unites them – phrases that stuck deeply in the Soviet minds. For instance, when the vulture tries to teach the ostrich to fly, he says: “Don’t know how – we’ll teach you! Don’t want to – we’ll make you!” The phrase went viral as it perfectly described the communist party’s approach towards the society as understood by Soviet people. This one is extremely hard to describe other than to say it is weird. Really weird. Super-weird. If there were a Hall Of Fame for the strangest stories dedicated to humans and aliens meeting each other, The Contact would be there like a flash. It starts with absolutely acid-color pictures of a blooming meadow where an artist appears accompanied by a melody of Nino Rota. The artist, with his manic smile and vivid imagination of butterflies and birds dead or caged, seems very creepy without any aliens. But then an alien (a shapeless and shape-shifting blob with three triangular eyes) appears and things get even more psychedelic. The rest is literally indescribable. Of course, we’re joking. The Contact is psychedelic indeed but it’s also a very kind cartoon touching upon the themes of misunderstanding, fear of the 'Other' and, ultimately, the unifying power of art. It definitely deserves to be watched – at least it will be hard to forget it. In case you are fan of animation, check out our material on how Russia is depicted in American cartoons.